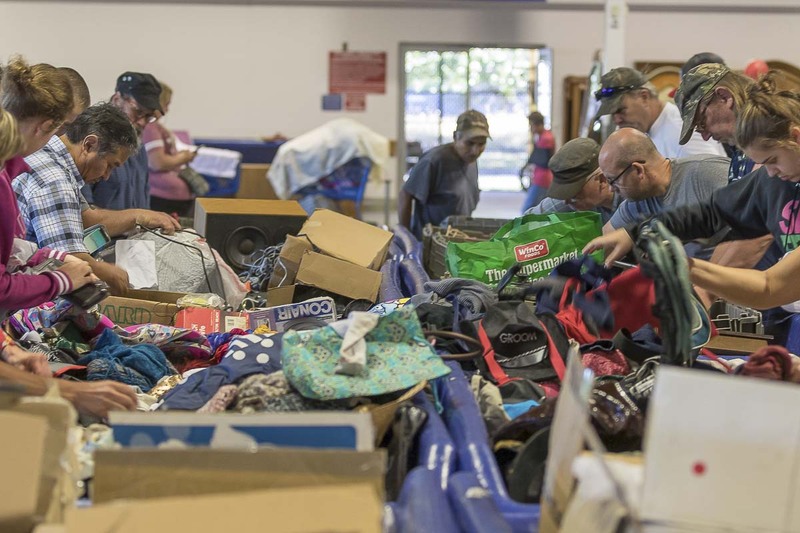 VANCOUVER — Last year people in Clark County donated more than 33 million pounds of unwanted stuff to Goodwill stores across the area. That makes our region one of the nation’s best when it comes to donating to Goodwill, according to Goodwill Industries Columbia Willamette spokeswoman Dale Emanuel. Of course not every item you unburden yourself of finds a new home. After about four weeks at one of Goodwill’s six (soon to be seven) local retail stores, items that haven’t been purchased are loaded up on trucks and shipped off to the Goodwill Outlet Store along SR-503 just north of Padden Parkway. Each day, around 10, 40- to 53-foot long semi trucks pull up to the back of the 43,000 square foot building, offloading dozens of massive boxes full of stuff. 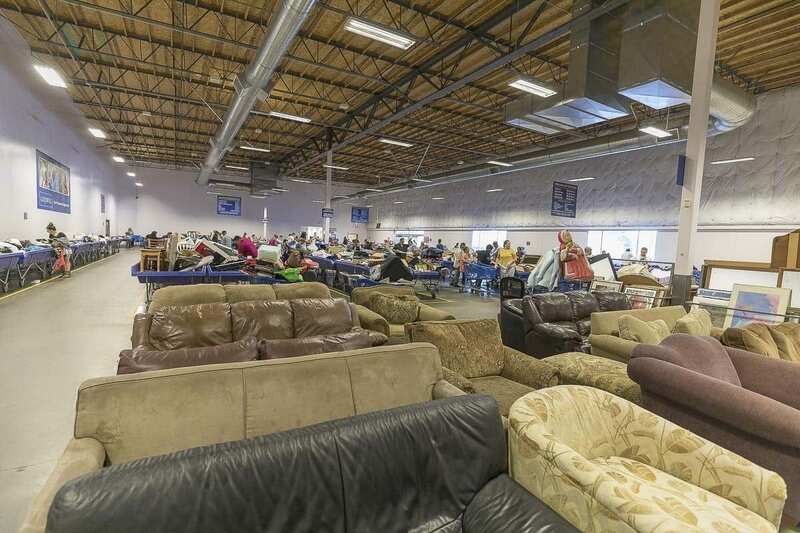 On average, 85,000 pounds of goods are either sold or recycled at the outlet store each day, supporting dozens of people who line up outside before the doors open at 8 a.m. and often stick around until closing at 8 p.m.. Most of what’s sold at the Outlet Store is by the pound, with costs going down the more you buy. 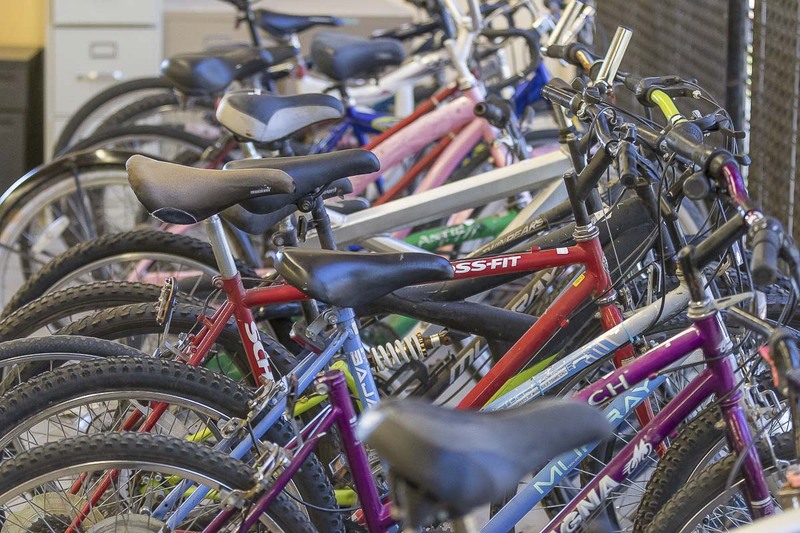 You can also find a lot of furniture and bikes that won’t fit into other Goodwill retail locations. While most Goodwill stores feature designs similar to other retail locations, most of the stuff that enters the sales floor of the Outlet Store does so in long shallow blue bins. Despite the competition around them, the process of greeting each new row of bins is surprisingly orderly. Shoppers line up behind a yellow line, and wait until a row has been completed before swiftly diving in to look for items they can re-use or re-sell. 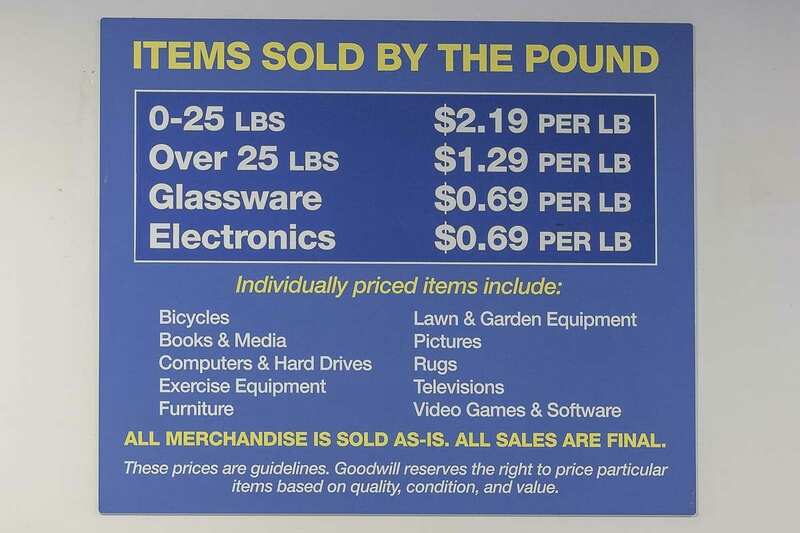 Items at the Goodwill Outlet Store in Vancouver come from other Goodwill retail locations and sell for pennies on the pound. Photo by Mike SchultzThe bulk of what comes through the Outlet store is textiles. Clothing and other materials that didn’t make their way into someone else’s closet or dresser. Often they’re used to make new items, like quilts, or to reupholster chairs or other furniture for selling. Housewares, such as pots and pans and other knick-knacks are next on the list, followed by bulk DVDs and CDs, electronics, and shoes, belts, hats, and other clothing accessories. Each blue bin that’s wheeled out onto the sales floor sits for only about two hours to be pawed through before being moved back into the warehouse. There, pretty much everything goes through a sophisticated salvage operation. Textiles are bundled into massive bales weighing around a half a ton. Electronics are shipped off to recyclers to have potentially hazardous materials removed. Over 80 percent of what moves through the Outlet Store remains in the recycle stream, thanks to partnerships with companies that buy up much of the bulk materials that end up not selling. The goal is to have no more than 20,000 pounds end up in the trash compactor each day, making Goodwill Industries’ Columbia Willamette one of the world’s leading recycling programs. As of 2016, CharityWatch.org rated Goodwill Industries with an ‘A’, saying 89 percent of donations go to cover programs. That means $9 of every $100 raised covers overhead expenses. A new Goodwill retail location is under construction in the Orchards area of Vancouver, with opening set for next December.